INK: Black sees the return of Edsel and Aiden approximately two years after the ending of INK: Red. Still mourning his Kathy and with the passing of Bob, Edsel and Aiden set off to Wales for a new start, hoping to evade the Eventuals and memories of the past. There they meet up with an enigmatic female named “Lash” (Don’t call her Lashae) and the trio fast becomes an inseparable if not dysfunctional family. Being a Tattoo enthusiast and amateur artist, Lash suggests that Edsel cover over The Ink with another color; black. Edsel eventually agrees and finds himself strapped to a gurney once again to attempt to negate the damage wrought two years ago. What he didn’t realize was that his attempt to disappear from the Eventuals’ radar was the very event that shone a spotlight on his whereabouts. 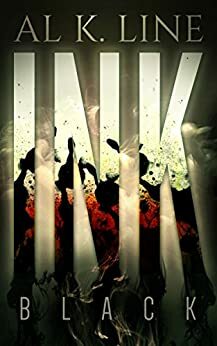 Kidnapped by a group of “ex” Eventuals and duped into taking The Ink a second time, Edsel finds himself once again in a kill or be killed situation; fighting for his life and the lives of his loved ones. After a chance encounter with the leader of the Eventuals, the group is left with even more questions than answers. This is yet another faced paced installment in the INK series. We get to catch up with some older characters and have a few new ones introduced. It was interesting to see how the Ink consumed Edsel even two years after the fact – almost to the point of distraction and desperate measures. The Eventuals are still a formidable foe, but not without their own “keystone cop” moments. Varik, as expected is mystifying in his supposed benevolence to the team yet terrifying at the same time. If you haven’t read INK: Red –go to that now, this series does not disappoint!